JOHNGY'S BEAT: Happy Birthday Laura!!! Today is the birthday of my oldest niece. I suppose I shouldn't call Laura a kid anymore, because she has grown into such a great young woman, but she'll always be a cool kid to me. I love the picture below. Few things would get me out of bed so early on a rainy October morning. Laura was doing a 5K downtown and I wanted to be there to cheer for her. 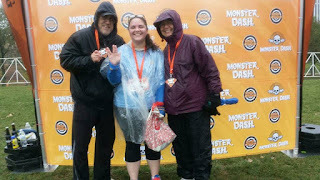 It was rainy and mucky and cold, but I was so happy to see her do so well in the run. Laura is such a unique person. She is opinionated, intelligent, funny and quirky (in the cool way). I love her dearly. I also love her regular Facebook posts with her beloved Marley. I always joke about our two cross country trips to New York. Feel free to ask her about her packing skills. The truth is I loved those trips. It was a rare chance to spend quality time with her (and Nancy). Don't tell her that I really viewed it as a thrill and not a chore moving her stuff back and forth. Happy birthday Laura. I hope your day is great and this is the start of your best year ever. I love you, kid! Laura, Nancy Blais and me in Chicago, IL-October 2015.